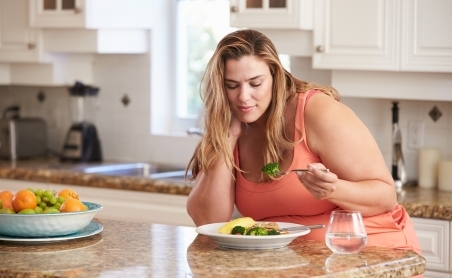 Changing what and how you eat, along with being more active, can help you to lose weight. Often even small changes, such as replacing unhealthy snacks with fruit or having smaller portions can help you lose weight. If you make small changes that you can live with, you’re more likely to lose weight and keep it off. Try some of the suggestions below. Skipping breakfast won't help you lose weight. You could miss out on important nutrients and you may end up snacking more throughout the day because you're hungry. 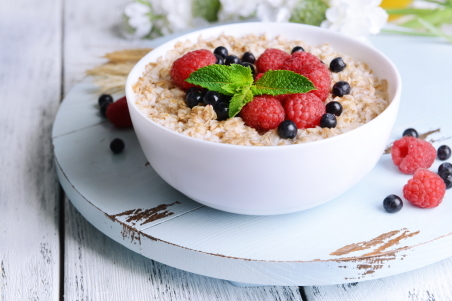 A wholegrain, low-sugar cereal with fruit is a tasty and nutritious breakfast. Appetite for Life has healthy breakfast ideas. Eat three regular, balanced meals a day. Try to have meals at planned times during the day and only include snacks if you're physically hungry. Being physically hungry means your body is giving you signals that you need to eat – for example, your tummy is rumbling, or you feel tired and lack energy. Healthy eating, active living has information about which foods you should eat, and in what amounts, to have a balanced eating plan. Vegetables and fruit are low in calories and packed with fibre, vitamins and minerals that can help to keep you healthy. Have at least three servings of vegetables and two servings of fruit every day. A serving is about a handful. Try to have vegetables or fruit at all meals. They also make great snacks. Appetite for Life has healthy snack ideas. Using your own hand can be an easy way to check the size of your portions. Because everyone's hand size is different, portion sizes vary depending on the person. The Heart Foundation has a handy factsheet that shows you how to use your hand size to judge portion size. Eating quickly, on the run, or while distracted can lead you to eat more food than you realise or need. Becoming more mindful when you eat can help you gain control over your eating habits. It may also help you to lose weight. Eat slowly and don’t rush your meals. It takes around 20 minutes for your brain to realise you’re full. If you eat too fast, by the time your brain realises you've had enough you may have already eaten too much. Remove distractions by turning off the TV or laptop and putting your phone down. Stop eating when you’re satisfied, rather than when your plate is empty. Ask yourself why you’re eating. Are you actually hungry? Is it healthy? You can find out more about mindful eating through this article and this video. Take cordial, fizzy drink, fruit juice, energy drinks and flavoured milk off your shopping list. These are all high in sugar and provide lots of calories but little nutritional value. The Health Promotion Agency has an easy-to-follow poster that shows how much sugar is in different drinks. For good health you need about 6 to 8 cups of fluid a day. Water is best, but if you are trying to lose weight, low- or reduced-fat milk (light-blue, green, or yellow-top) and tea and coffee with no sugar are also fine. If you find it difficult to drink tea and coffee without sugar, add a tiny amount of stevia, a natural sweetener. Most takeaways are high in fat and salt. Only have them on special occasions. When you do have takeaways, choose healthier options. Knowing how to read food labels can help you choose healthier options when you're shopping. Alcohol is high in calories and can sometimes make you feel hungrier. Cutting back can help you lose weight, and it's good for your general health. homemade lemonade – add some lemon juice to soda or sparkling water. If you want a sweeter taste, add a small amount of stevia, a natural sweetener, or replace the lemon juice with some diet lemon cordial. Try to plan your breakfast, lunch, dinner, and snacks for the week. You may find it helpful to make a weekly shopping list. Meal planning and healthy recipes has ideas to help you plan and prepare tasty, fast, easy, and low-cost meals. If you've tried these suggestions and they aren’t working for you, consider seeing a dietitian. Written by HealthInfo clinical advisers. Page created September 2017. Last updated October 2018.